Our story begins in 2010 and is entirely driven by an accident. When Krzysiek Szczygieł, one of the founders of 4nano, after years of running his own business decides to fulfill his automotive passion and starts working at the newly opened Jaguar and Range Rover dealer, he is not aware how much of an impact the decision will have on his future. Around the same time, Rafał Bartosiak, the second of the brand’s founders who has always been passionate about cars, and his dream was his own car cosmetics store, is taking its first steps in the detailing industry and is trying to introduce one of the UK cosmetics manufacturers to the Polish market. Accidental meeting of colleagues from the car club changes everything. At this point, probably any other story would end, and everyone would go their own way … nevertheless, seeing the effects of this whole detailing and dreaming silently about his own brand, Krzysiek decides to remodel a business idea a bit. He invites his father to participate in the project. This way, Marian Szczygieł, a chemist by profession and an experienced trader who has numerous contacts in the western markets, is the next founder of the 4nano brand and helps young people to take their first steps in the new industry. The company is formed very quickly, because the roles are clear and the challenge is intriguing. From the perspective of years, each of these ideas and a quick start will seem crazy. In March 2011, the 4nano brand is introduced to the market which is the official name of the company that aims to provide professional car cosmetics as of the highest quality. A family company, Polish … not afraid of foreign competitors. The first phase of development is mainly the expenditure on technology, outsourcing on the western production lines and simple, white and black packaging that you can see in the pictures. This is also the time when the word “detailing” in Poland is virtually unknown, the market is dominated by waxes, and if there are any detailing workshops, none of them calls themselves a detailer. There are car washes, car cosmetics … and at least 10 other quartz coatings competing with our Lack Protect 3D. Despite this, thanks to the effectiveness of the coating and the honest message of its functioning (which remains our philosophy to this day), and above all the enormity of Marian’s sales work, the coating is well received by the market. Like all other car cosmetics dedicated to professionals and enthusiasts. Of course there are also failures – just like a series of cosmetics dedicated to home, garden … does anyone remember it yet? We do not think so. It is also a time to make customers aware and shape the market, many journeys, presentations, trainings, first exhibitions at rallies … and, above all, small profits, which are still invested in the development of the brand. Then we also enjoyed every little success, every “like“ on barely known then in Poland – Facebook, every small order and word recognition from the customer. Each stage, however, has its end. At a certain stage of company development, we decided to put everything on one card and invest all resources in the development of technology, which was completely unknown in Poland. Ceramic coating – it sounded intriguing, innovative … but completely meaningless for the entire Polish market. And so on February 2, 2013, the first ceramic coating 4nano Sapphire appeared on the Polish market, and along with it the entire Pro series. Hardly anyone remembers, but before this event all the collateral offered on the market were either waxes or quartz coatings. So we can say that we were the precursors of a very big change, because nowadays it is difficult to imagine a different varnish protection than a ceramic coating. History repeats itself, so we’ve spent hundreds of hours on telephones and meetings with clients, hotels and cars … but this effort paid off 100%, because the adoption of the new series by the market exceeded our wildest expectations. Of course, new products appear simultaneously, and their entire graphic design is refreshed. During this time, we are also building the links of the current network of Certified Workshops, many of which have remained with us to this day. We also warmly remember all the trainings, all of the Partners of that time, people who were nice to meet and exchange experiences. Well, events that at that time we visited probably all – Raceism, Tuning Show, All Stars Tuning Weekend, Dub It etc. During this time, our ceramic coatings, thanks to our partners, have been applied to hundreds if not thousands of cars, among them were such icons like Ferrari F12 Berlinetta, Lexus LFA, Nissan Skyline R34 GTR, Porsche GT3 RS, Maybach and many more. After years, it is nice to review all these relationships dear Partners. We have also remained faithful to our philosophy and the fact that if 4nano says that a coating is supposed to work for two years … it will. Thanks to this, we have gained the trust of both our Partners and end customers, which has been confirmed by the multitude of positive opinions about the brand. So we can say that we were the precursors of a very big change, because nowadays it is difficult to imagine a different varnish protection than a ceramic coating. The period of 2013-2015 is the next stage of 4nano development, especially the technology of ceramic coatings. More new products are appearing, including the 4nano Rock ceramic coating, sensationally adopted by the market. During this period, the brand is also beginning to be present on the Czech market and, naturally, the main development is put on car coatings and cosmetics. During this time, of course, we have not forgotten about the further development of technology and our products, and loads of euros spent on this purpose allow us to constantly provide you with the best, proven and safe detailing products on the market. There was also a third graphic design of our products, which especially appealed to customers. We have also managed to implement several major advertising campaigns, among others, in the Forbes national business magazine. In 2016, finally, the decision is made to open our own detailing studio, which will also be the company’s headquarters and training center. The choice of location is no longer accidental and it is the hometown of Marian and Krzysiek, Katowice, in the prestigious area of the Bażantowo estate. And so, officially, 4nano Studio Katowice is being created, and the first car that arrived at our doorstep is Aston Martin V12 Vantage S. Pretty good for a company that was born out of a garage event. But this only proves the trust that clients give us, seeing our passion, experience and commitment to the smallest details. 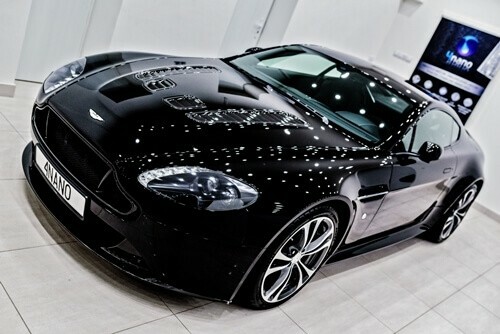 And so also officially 4nano Studio Katowice arises, and the first car that came to our doorstep is Aston Martin V12 Vantage S.
As you could read earlier, we always try to develop and provide you with the best possible technology and detailing cosmetics … so in 2017, next-generation ceramic coatings with Hyper Hydrophobic technology were introduced to the market. Of course, 2018 will bring new products and a new chapter in the history of the 4nano brand. The brand, which for several years has achieved considerable success on the Polish market, but looks more and more boldly on foreign markets. Of course, all this would not be possible without our clients and partners. At this point, many thanks to everyone – those who have been, are, and will be. We hope that this story has brought you closer to the 4nano brand. And if you want to be part of this beautiful story – go ahead, write to us, let’s talk about what we can achieve together.